The following are some pictures I took on a revisit on Thursday October 25, 2007. 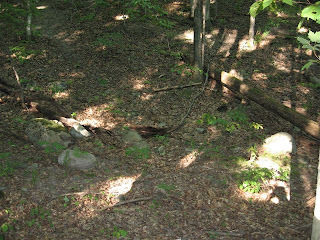 Pictured is the Spirit Keepers site next to the herd path as you first enter the site on your right side--several flat stones circled by round stones. It was reconstructed and marks where a sacred site previously was. It sits in a stacked field of consciousness. I suggest you spend some time in meditation or prayer on it. Pictured are Pepper (white dog) and Lucy (Black Dog) who are best of friends. Ten feet right of Spirit Keepers site mentioned above is a sacred circle whose center is sunken(approximately 1 deep). The circle was in remarkable condition and I only added a few stones to reconstruct it. East of the recently constructed stone monument by the campfire area you will find the stone remains of a third long house. At the southern tip of the remains you will find an intact ceremonial circle. Continuing up the mini ravine east of the third long house you will see a 2 ½ ft. high by 3 ft. in diameter stone that is part of a sacred circle. As the picture shows several large stones that appear to be part of the circle remain. Since this circle is next to base of the ridge I wonder if it is part of the 10 large circles I refer to in my review of Clarks Gully that are also located right next to the ridge (about a 100 feet away). Lower Clarks Gully is a very busy place and a challenge to determine all what is going on the relationship of things to each other. Here are some more pictures I took of sacred sites. Since I first posted my review of Clark’s Gully and began cleaning up the space someone has created a small monument pictured above. It is not strategically located (ie on earth phenomena) and can be found by the large campfire area. Maybe the revelers that frequent the campfire area were behind this. I find this very interesting and an affirmation of the power of Clarks Gully. I believe that people are drawn to the same site over and over again through out history. Many times I find a stone structure or pile of rocks that is not very old, but when I look closer I find that history is repeating itself; that the old farmers stone pile marked the intersection of several Native American trails or was a gathering place, etc…Stone structures deteriorate over time, but the spirit of a place, particularly if it is strong, can be indelible. 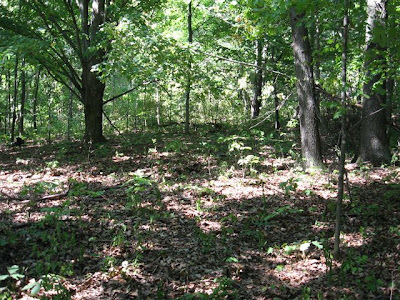 The fact that the Seneca people believe that they were born on South Hill, Clarks Gully lies at its base, and that Native American historian A. C. Parker and NY State Historian William Ritchie found mounds and stone structures associated with the Adena culture there speaks volumes to the power of the place. The area still has a very good vibe, a strongly positive geographic samskara, is a testament to what went on there before. However, a variety of actions less focused on God and spiritually have been transpiring there for some time. Still it is positive. We all look for meaning in our lives, whether we are ascetics or party goers. How we find that meaning and represent it is a function of who we are, our focus and our intentions. No doubt people that created the monument felt the call of the land to create something. Yesterday we found several sacred sites on the ridge above the lower creek bed in Clarks Gully. Since there are numerous sites there I am going to begin referring to the area as Upper Clarks gully. We reconstructred a very large circle--3 of the original stones (2-3 feet in height) were left. One of the areas David Robinson refers to in Who Built the "Old Fort" on Bare Hill http://www.crookedlakereview.com/articles/101_135/103spring1997/103robinson.htmlquoting Native American historian A. C. Parker and NY State Historian William Ritchie associated with the Adena culture. Unfortunately it was too late to take pictures. We were able to take the picture of the circled stone that marks the intersection of two spirit lines (lines of consciousness, ley lines) http://www.jubileeinitiative.org/Gaiassoul4.html and two energy lines. Going away from the base of Clarks Gully, the campfire area, and up the ridge where the herd path is you will find several sacred spots. One was revealed to me while I was there last; I would imagine that there is a lot more there. Expect further updates. If you walk the 30-50 feet up the ridge (next to the stones) and continue for another 100 feet you will come upon a stand of large trees (mostly maple). It will be a steep climb but the ground above will be totally flat. The trees sit on a stacked (4) field of consciousness ( http://www.gaiassoul.org/ )and if you look closely the trees appear to be aligned in a circle. Dowsers will tell you that trees often belie what is going on with a space. In the center of the trees is a fairly large ceremonial circle that I have marked out with stones. 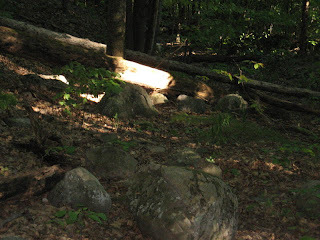 At the base of Clarks Gully just east of the campfire area before the ridge that begins the herd path(trail) up to the top of South Hill you will notice several masses of large stones (1-2 feet in height). These stones are amassed in several circles. Prayer can leave a dowse able energy lines and I was able to dowse out sacred cirlces for several stone piles. These are some additional pictures. Located at the base of Clarks Gully you will find the remains of several long houses. You can dowse out the energy lines of two long houses whose dimensions approximately 15’ x 60’ and 20’ x 65’. You can find the remains of another long house just to the east at the top of the ridge, about 50 feet up. All that is left of the sacred long houses are piles of stones that look like rubble. While it is unusual to find a large stone component to long houses that appears to be the case. They look like an extremely wide stone wall that has fallen down, they are not more than 6-12 inches high but are over 10 feet wide plus. They are in fact the remains of two long houses. Here are some more pictures of the Spirit Keepers area at Clarks Gully. This area can be found at the based of the gully next to the campfire area. Pictured below is a large manito shaped stone strategically placed in a field of consciousness.